You can store electric energy in a battery. You will frequently need several batteries connected together. Batteries are characterized by their storage capacity, which is given in amp-hours, and their voltage, which is measured in volts. Charging batteries can be complicated; if you don't do it correctly, you can damage the battery. You can use a battery charge controller to ensure that the batteries are not overcharged, and that they are topped up with electricity to keep them fully charged when not in use. Solar photovoltaic panels are one way to collect and store electric energy. Calculate how much electric energy you want to store. Electrical energy is measured in kilowatt-hours: kWh. 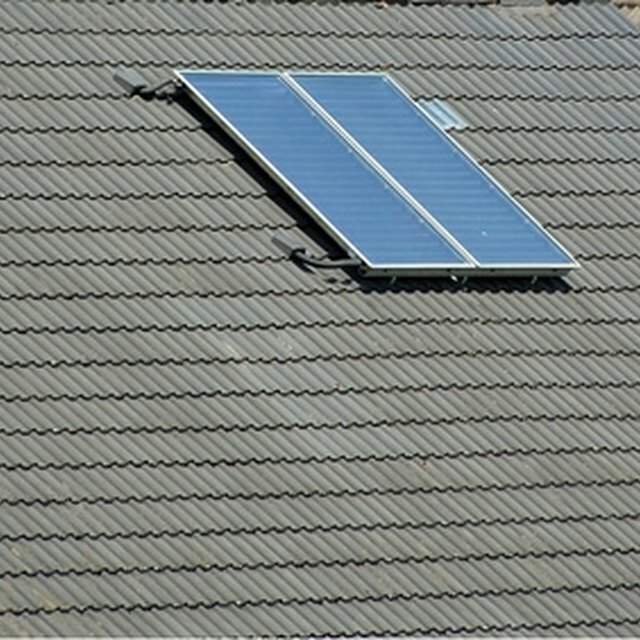 If the source of electricity is a solar panel, it will generate its rated power for between four and six hours a day, depending on your location. So, a 1,000-watt array of solar panels could send between 4,000 and 6,000 watt-hours of electricity to a bank of storage batteries. Dividing by 1,000 to get kWh, you find that storing, say, three days' worth of electricity from the solar panels requires batteries that can store between 12 kWh and 18 kWh of electricity. Search the Internet for suppliers of deep-cycle lead-acid batteries. Lead-acid batteries are an efficient and reliable way to store electric energy. Deep-cycle batteries are best for systems that provide power for lights, appliances and other equipment in a house or commercial building. Contact suppliers and explain how you plan to charge the batteries and how much electricity you want to store in them. You can use either 6-volt or 12-volt batteries. Write down the capacity in amp-hours of the battery you want to buy. Calculate how many batteries you will need. Multiply the amp-hour capacity of a single battery by its voltage to get watt-hours of stored electricity. For example, if you choose a 12-volt battery with a 120 amp-hour capacity, multiply 120 by 12 to get 1,440 watt-hours of electricity. Divide by 1,000 to get kWh, and you get 1.44 kWh. This is the amount of electric energy you can store in this one battery. Divide the amount of electricity you want to store by the capacity of a single battery to determine how many batteries you need. For instance, to store 12 kWh of electricity, divide 12 by 1.44. This gives 8.3. Round this number up, not down. So, you would need at least nine batteries, and given the energy losses inherent in battery storage systems, it would be safer to buy 10. Determine what kind of battery charge controller you need. A 12-volt charge controller is sized for the maximum current that will be used to charge the bank of batteries. How much current is available to charge the batteries and store the electricity depends on what technology you use to generate the electricity you want to store. If you use 12-volt solar panels, look in the installation manual for the panels and write down the maximum current in amps produced by a single solar panel. Multiply the current by the number of panels to get the maximum current produced by all the panels together. Go to a local supplier, or go onto the Internet, and buy the batteries you chose. Select a 12-volt battery charge controller rated for the maximum current in amps generated by the source of electricity. Buy this charge controller and ask the supplier what gauge of copper wire is recommended for the connection between the charge controller and the batteries. Decide where you will place the batteries. They should be inside the building in a cool, well-ventilated space. Install the charge controller on a wall close to the batteries. Buy a sufficient length of copper wire to connect the electricity supply to the charge controller and the charge controller to the batteries. Connect the 12-volt batteries in parallel. Arrange the batteries side by side. Take a battery interconnect cable and connect the positive terminal of the first battery to the positive terminal of the second battery. Take a second interconnect cable and connect the positive terminal of the second battery to the positive terminal of the third battery. Continue in this way until all the positive terminals are connected along one side of the batteries. Repeat the procedure for the negative terminals. For 10 batteries, for example, you will need 18 interconnect cables: nine to connect the positive terminals and nine to connect the negative terminals. Connect the battery charge controller to the batteries. Consult the controller's installation manual and follow the instructions for connecting the device to the batteries. Connect the charge controller to the solar panels or whatever else you are using to generate the electricity that you will now be able to store and use again. Connecting batteries in this way, and using a charge controller, will let you store a useful amount of electrical energy. But remember that this is direct current, or DC, electricity. To take this DC electricity from the batteries and use it to power the alternating-current, or AC, appliances and equipment found in the home will require an inverter to transform the electricity from DC to AC power.